Drum up some fun for the holidays with our Drummer Boy Cake. 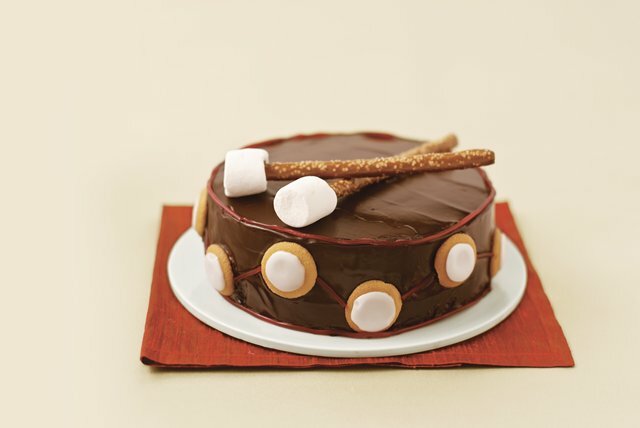 Decorative and delicious, Our Drummer Boy Cake is the perfect addition to your holiday spread. Refrigerate 1/3 of the COOL WHIP. Return remaining COOL WHIP to freezer. Prepare cake batter; blend in dry pudding mix. Bake as directed on package for 2 (9-inch) round layers. Cool cakes in pans 10 min. ; invert onto wire racks. Cool completely. Meanwhile, mix 2 Tbsp. powdered sugar and milk. Brush onto wafers. Microwave frozen COOL WHIP and chopped chocolate on HIGH 1-1/2 min. or until chocolate is melted, stirring after 1 min. Cool 15 min. to thicken. Beat cream cheese and remaining sugar with whisk until well blended. Stir in cherries and thawed COOL WHIP. Stack cake layers on plate, filling with cream cheese mixture. Frost with chocolate mixture. Decorate with wafers and remaining ingredients to resemble a drum and sticks. Refrigerate leftovers. Prepare as directed, using JELL-O Chocolate Flavor Sugar Free Fat Free Instant Pudding, PHILADELPHIA Neufchatel Cheese and COOL WHIP LITE Whipped Topping.